Manufacture starting Jan 2019, taking orders now. Order at your local Landmark store. A trailer that lowers flat to the ground, with it’s own sheltering roof that helps to keep you cool in the sun or dry in the rain! 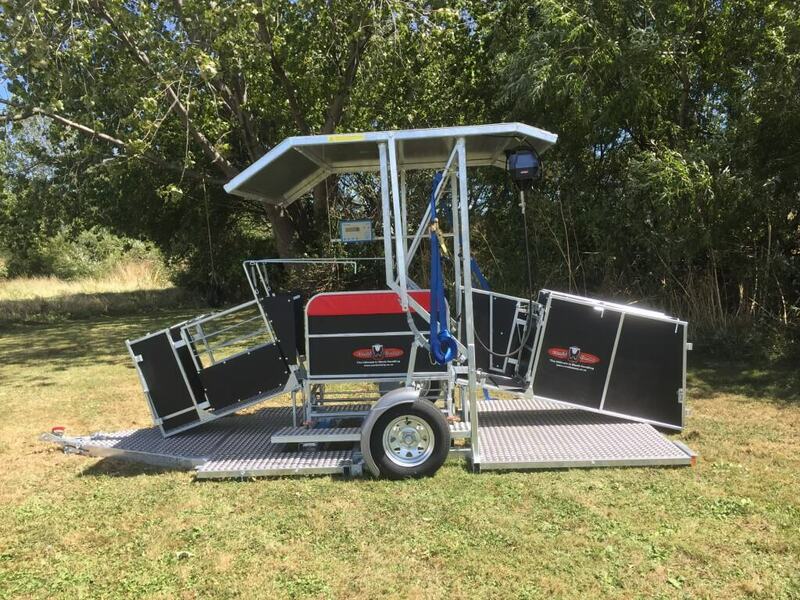 The Combi Trailer enables you to have a totally mobile Sheep Handling System that is effortless to set up in a short time. The Combi Trailer can travel at normal trailer speed limits because it has suspension, lights and mud guards. An increasing number of people travel between properties are requiring the need for mobile sheep handling units. 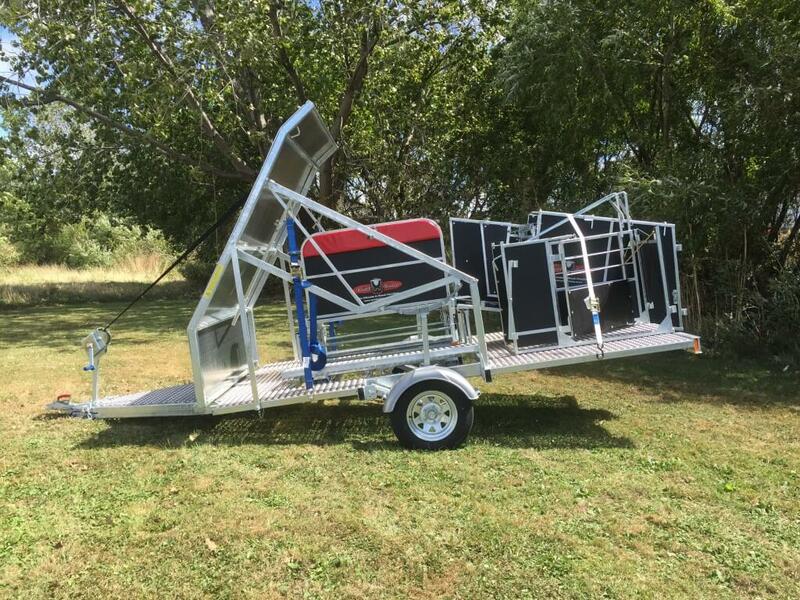 This is why we have spent some time designing a trailer to go with the ever so popular Combi Clamp sheep handler. 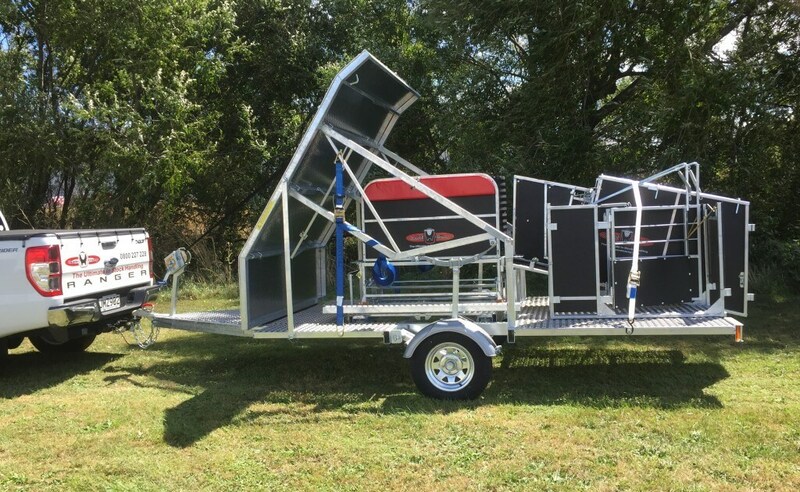 Existing clients can purchase the trailer only and put their old Combi Clamp on the trailer. Ten seconds to lower. Two minutes to setup. Lowers fully to the ground. Roof for weather protection or shade. Sun or Rain, you are sheltered by the roof! Scales indicator and dagging plant is hung from roof. Plenty of hooks for hanging equipment and gadget holders. Roof is clad in Aluminium for heat deflection. A boat winch is used to pull the roof down to the draw bar. This activates the swing arm and leaf spring suspension, lifting the trailer. The draft has been moved from the front to the rear to allow the roof to come down. The load bars are permanently fitted in the trailer. This can be done with minimal strength. The roof then acts as a stone/mud guard. 1500 kg suspension. Room to carry panels equipment etc. Quick setup and pack up. Most farmers like us are time poor with multiple farms or an off farm interest. This has meant we needed to design something that is quick to set up and without the need for great strength. We needed something that was strong but had to be easy for a lighter person to set up. That was a challenge! Trailer goes flat to the ground so the sheep can see through to their mates in front. Eve on the front of the roof to stop those jumping sheep. Floor main frame is 100x50x4 RHS, strong. 2.5mm Aluminium perforated sheet floor. Load bars are set into the floor for ease of use. Grease impregnated nylon bushes on the swing arm suspension. Lights fitted to legal standards and enclosed to avoid damage. Room to carry panels, drenches etc. Multiple hitch points in the roof for drench packs, dagging plant etc. After many years of farming and still on the land now. I have found that us farmers have a problem with setup times. If it takes too long to set up then you tend to change your method. This trailer takes no time at all and can be set up by any one. The days of towing trailers that aren’t quite road legal are long gone on our main roads at least. Trailers that have no suspension can only travel at a maximum of 50 km/hr on open roads in New Zealand. This is why we have suspension to lift our legal travelling speed and to give the load bars a smooth ride, reducing load bar damage. 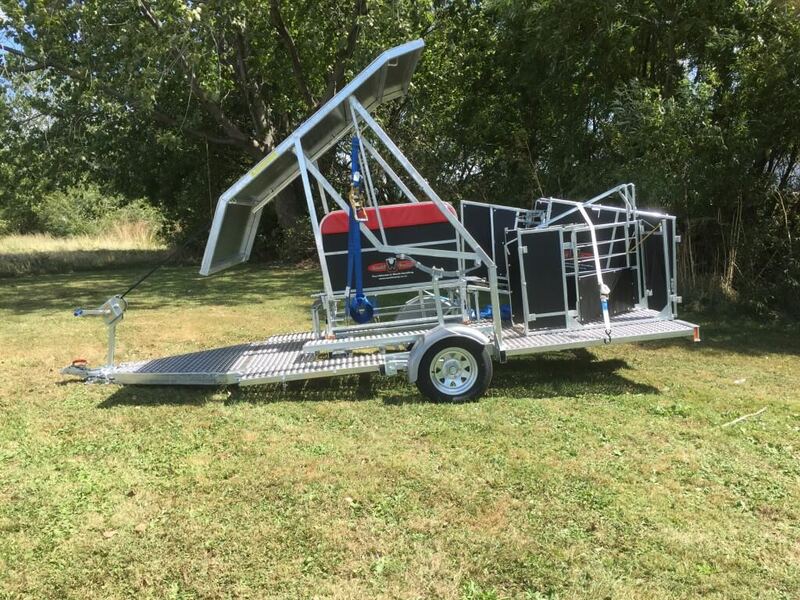 Once again we have produced a product that requires no power, air or hydraulics to make this trailer work. Just like the Combi Clamp Sheep Handler. Our goal as a company is to make life easier for all farmers.